make a significant contribution to overall aesthetic appeal of your tile design. Carefully selecting the correct grout for your tile floor, wall or backsplash will both help you achieve the desired appearance and improve resistance to damage and staining. What types of grout are available, and which one is appropriate for my tiles? Grout comes in two basic types – cement and epoxy, both of which can be either sanded or unsanded. Cement-based grout is used frequently – it’s economical, available in most areas, and easy to apply. Epoxy grout, made of resin combined with a hardener, is more expensive and can be difficult to install. But it is also a lot more durable and resilient, and might be the appropriate choice for high-traffic areas often exposed to harsh cleaning chemicals and stains, particularly grease. 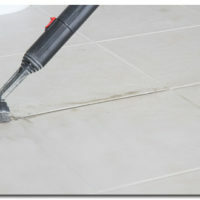 Whether you use sanded or unsanded grout depends on the width of your grout joints – the spaces between the tiles. Sanded grout – most often used when installing floor tile — is a bit tougher, and prevents hairline cracks caused by grout shrinkage. If your grout joints are wider than 1/8 in., consider using sanded grout, no matter what surface you’re tiling. While sanded grout can be a little trickier to apply, its use can help you avoid costly grout repair and grout replacement in the future. What color of grout should I use? Well, that depends entirely on your personal taste and the look that you want to achieve. There are no hard and fast rules. Grout color can blend or contrast with your tiles, or simply be neutral – usually a shade of white, beige, or grey. If you’re unsure, neutral grout is often the safest, most versatile way to go. A neutral color, while perhaps lacking dramatic visual impact, can work with most tiles and room décor. Feeling a bit more adventurous and ready to opt for the black tile with hot pink grout joints? No matter what color combination you’re thinking of using, have your contractor make up a few sample tile and grout sections, and see if you still like the appearance of these mock-ups after a few days. It might cost more, but you’ll get a much better idea of how the tile and grout combination will look when fully installed – and possibly avoid a costly re-grouting job if the result isn’t as you had originally envisioned. Should I seal my cement-based grout? While sealing cement-based grout is optional (epoxy grout never requires a sealer), it’s generally a good idea, especially with lighter-colored grouts installed in areas exposed to a lot of moisture, or prone to spills and stains. Sealing grout makes a porous grout surface a lot more resilient and easier to clean – that’s always a plus! These tips will help you make an educated decision when learning how to choose the right grout. If you’re planning a tiling project, consult with a Grout Medic tile and grout expert for further advice on choosing and caring for tile and grout. The Grout Medic’s professionals will work with you to achieve and maintain results that match your creative vision for any home space. Contact us today.